Gokceada as being the largest island of Turkey, has beautiful coasts and chrystal clear waters in the Agean sea. Gokceada is also famous with its impressive sunset and plenty of fish dishes. A pleasant boat ride from Kabatepe or Canakkale of around an hour and a half brings you to Kuzu Harbour on Gokceada, the largestof the Turkish islands. Situated on Turkey's furthest westerly point, Gokceada is a popular tourist destination with a host of cultural assets and striking natural beauty. According to Greek mythology, the palace of Thetis, mother of Achilles, king of Phthia, was situated between Imbros and Samothrace. The stables of the winged horses of Poseidon were said to lie between Imbros and Tenedos. Gokceada was dominated by many nations and tribes throughout history. It has always been somewhere attracting because of being an important point at the entry of the Dardanelles. Because the island was so often invaded, no development was established; besides, the folk was harmed. The folk sick and tired of the pressure and discomfort gathered a committee to Plead Fatih Sultan Mehmet, the sultan of the Otoman Empire at the meantime, for protection. It is accepted that the first tribe stepping on the island is the Pelagians(Akalar).the Works found as a result of excavations under control of Prof. Dr. Halime Turkyılmaz indicate the fact that the history of the island date back to 5000 years before. After the Pelagians(Akalar); Persians, Athens, Spartians, Romans, Byzantines, Genoses Venetians and Turkish Republic dominated Gokceada respectively. The folk themselves requested protection from the Otoman Empire. Althougt the island has been inhabited by many civilizations, so little trace did they leave behind due to the depredation after each war. In the history of Gokceada, the ruins of each dominating civilizations have been scattered in the island. The most important of them is 5 thausand years' tumulus on Cinarli plain. The grave made of rock in Aydincik and the tomb graves behind a house in Kalekoy are very interesting. There are ruins of a castle left from Geoneses. There are also ruins of an old castle in Seytan Kayaliklari in the site of Kapikaya. The headquarter used by the English in World War I, ruins of a barrage lake and the sunk in the sea in Guzelcekoy are highly interesting. There also take place laundaries, cannons and documents from the Otoman Empire. In the seas are observed many old sunks and anphoras. The ancient looms, barrels, wooden things are under protection. The ruins of presumably the oldest barrage are in Roksados. In Thameni 'the place of buried treasure' in Tepekoy, archeological ruins have been found. Various archeological ruins are excavated in Kefaloz in Yenimahalle, in Balidosta in Tepekoy, in Arasia and Krioneroda in Zeytinlikoy and in Pirgosta and Kastro in Derekoy (Yukari Kalekoy). Gokceada is also famous with its grapes. Gokceada (Imbros) is an area of 289.5 in kilometers. The lengths from North to South is 13 Km and East to West 26 Km. The island is located 33 miles away from Canakkale but 14 miles from Kabatepe Sea Port on the Gallipoli Peninsula. Furthermore Gokceada is 16 miles away from the Greek island, Limni, 14 miles from an island named Samothrace. Gokceada is regarded as the 4th largest island of the world in terms of fresh water sources. The Island has 9 villages and a township centre. These are Kalekoy , Eskibademli , Zeytinlikoy , Tepekoy , Derekoy , Ugurlu , Eselek and Sirinkoy. The population of the centre is 7100 the number of inhabitants of the villages is 1500. but during the time Of the winter it is about 10000 (population). Gokceada population is 8210 people. Older name is Kastro (Latin and Greek for castle). Located on the north-eastern coast of island, there is an antique castle near the village. Kalekoy also has a small port which was constructed by the French Navy during the occupation in the First World War, and is now used for fishing-boats and yachts. It is located at the center-northeast of island, near Bademli. It has many motels and pensions. Older Greek name is Gliky. It is located to the northeast of the island, between Cınarlı town and Kalekoy/Kastro. Older Greek name is Aghios Theodoros. Demetrios Archontonis, known as Ecumenical Patriarch Bartholomew I of Constantinople, was born there on 29 February 1940. Older Greek name is Agridia. It is located in the north of the island, and is home to the largest Greek population on the island. An extinct volcano is located south of village which is the highest point of island. It is located near Derekoy. Older Greek name is Schoinoudi. It is located at the center of the west side of island. Due to the emigration of the Greek population (largely to Australia and the USA; some to Greece and Istanbul before the 1970s), Dereköy is largely empty today. However, many people return on every 15 August for the festival of the Virgin Mary. It is located in the southwest of island. It is located in the west of the island. It is located at the southeast of the island. It is an agricultural area that produces fruit and vegetables. When you reach Kuzulimani -- the port of the island by ferry there are rock formations on the coast, which are typical to this island. 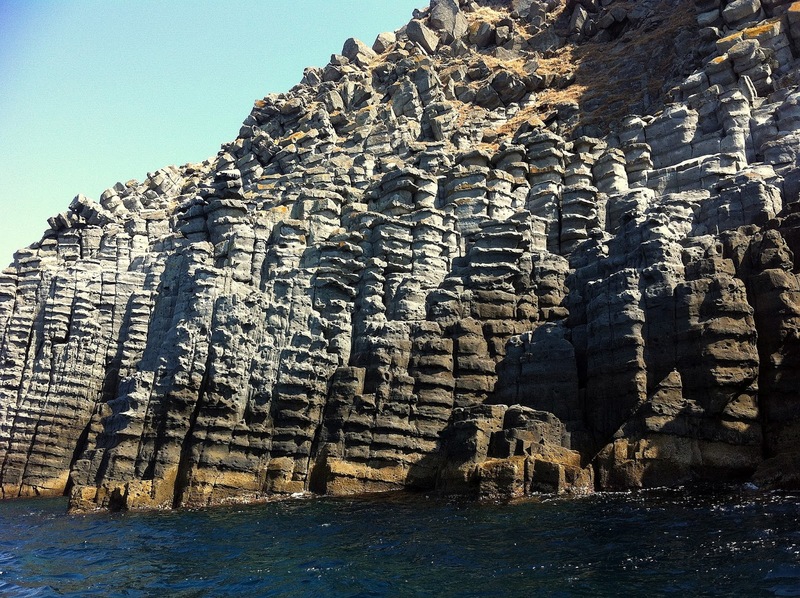 Varied landscape and rock formations is usual for this island where tectonic movements and the effect of fault lines passing through the island are visible as well as the effect of wind and water sources. It is surprising to see such a variety in a small island. Behind the Aydıncık beach there is a salt lake where the mud is rich in sulphur therefore claimed to be good for skin health. Marmaros waterfall located in Gokceada. In order to get to the Marmaros waterfall you have to take turn to the right at the Ugurlu exit from the village of Derekoy. After you travel seven kilometers on the asphalt road you have to leave you car as it is not possible to drive all the way to the waterfall. The waterfall, which is to the right side of the road , can be reached by apath on foot The Waterfall flows strongly in winter but in the summer months the level of water falls greatly. For those who want to have a tet-atete with nature or like trekking, the Marmaros waterfall is an unmissable opportunity. Aydıncık beach (also known as Kefalos) and the salt lake – in the southeast part of the island, about 10 km from Merkez. 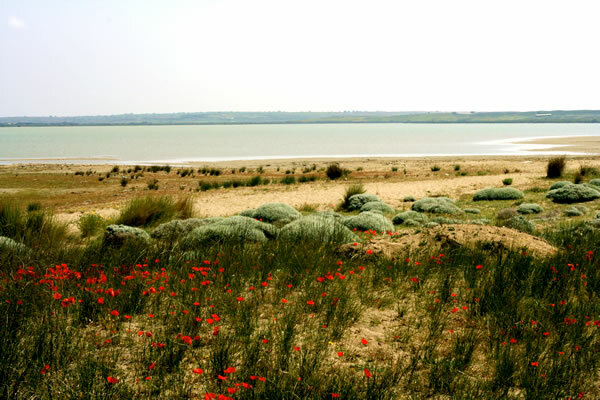 A low dune separates the sea and the lake, which is very shallow, about 1 metre depth in its deepest parts. In the olden times, before commercial packaged salt was available, islanders were producing their own salt here. The lake smells funny because of some natural chemical it contains, which is said to cure some skin problems. It is a good idea to first have a mudbath in the lake and then rinse in the sea (Be careful, there are lots of sea urchins –which can spoil your trip if prick on your skin, especially feet- around this area). In the Kokina region, approximately 18 kilometers from the town of Gokceada on the right of the road linking Aydincik to Ugurlu, there is a carved rock tomb. though the exact date of the two person tomb carved into the stone is not known it is believed to be from Roman area. the tomb is about 100 meters to the right of road. You can park your car nearby and walk to the tomb. The Kuzulimani is the place where boats linking Gokceada to the mainland pull in. Thus it is the first place of meeting on the island and of welcoming guests. Apart from this, it also popular for its beach area. You can get cooling drinks from the tea garden near the beach when you are overwhelmed by the heat. In summer sporting activities such as beach volleyball are frequently held here. This is one of the most popular picnic areas on the island.ITt is a pleasant site for a family wanting to have a good time, with the fountain running in summer and winter and the hundred year old plane trees right next to it. It is some 22 kilome ters from the town center . After you pass the small lake formed by adam and follow the road to the Kapikaya region ,you come to the Karayollari Fountain. It is on the right side of the road and is tucked into a scenic forest with olive and other types of trees surrounding it. The Yenibademli Hoyuk ( tumulus or burial mound ) is the site of the first systematic archaeological excavation conducted on Gokceada. The site in the direction of Kaleköy and three kilometers from the Gokceada town centre , lying on the left side of the road. The Yenibademli Tumulus is of medium size , covering an area of 120 meters in an east-west direction and 130 meters north to south. The mound rises nine meters above ground level area and 18 meters above the sea level. Excavation s began in 1996 with the permission of the Monument and Museum Directorate of the turkia Culture Ministry and were conducted by an archaeological team headed by Associate Professor Halime HURYILMAZ from Hacettepe University's archaeology Department. This is one of the most beatiful and unforgettable coves of the island.It attracts attention due to its interesting rock formations. 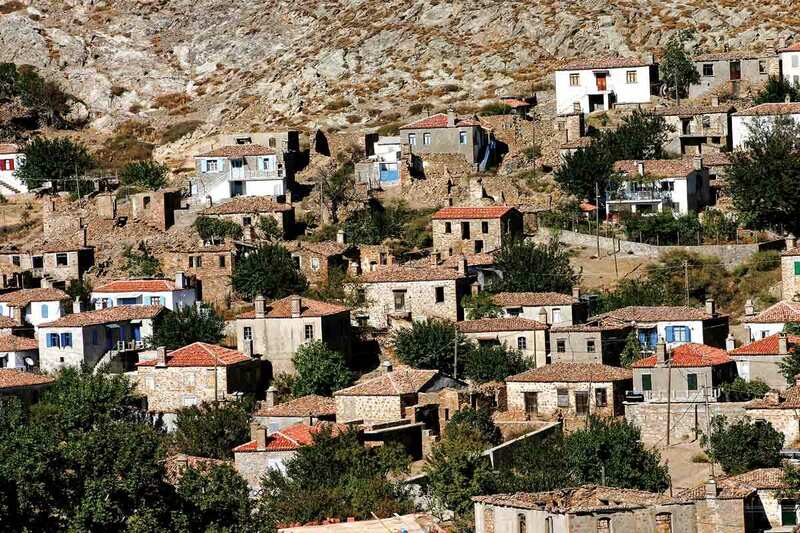 It is possible to get here on foot from Upper Kalekoy as well as by driving through the village of Yenibadem li by car. The area between Yildizkoy and Yelkenkaya has been allocated to the Turkey Research Foundation (TUDAV) to reundertake research on the regions underwater beauty. It has also been declared an Underwater National Park.This is Turkey's first and only such park.